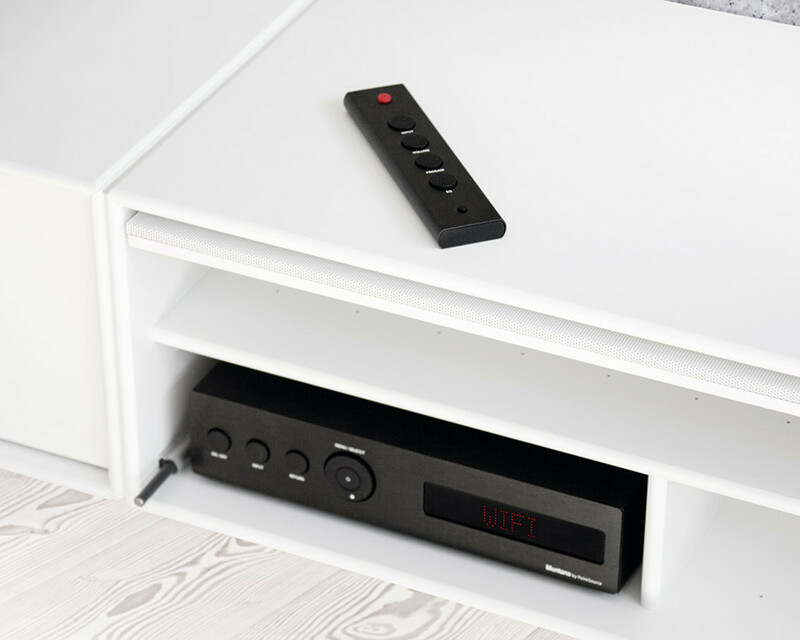 The SoundBy PointSource Receiver is a compact yet powerful stereo amplifier with HDMI, AirPlay, DLNA, and DAB+ radio connectivity. Despite its compact size, it incorporates a power supply and amplifier that delivers powerful sound levels with low distortion and great sound quality. 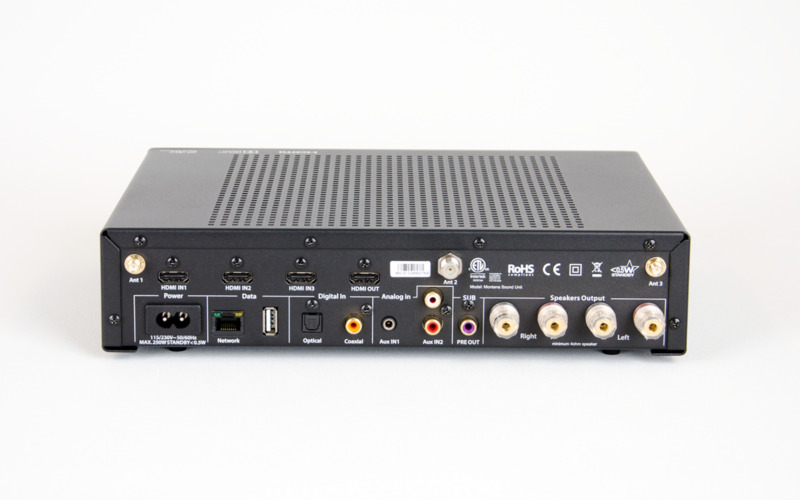 The SoundBy PointSource Receiver offers the music connoisseur a unique combination of a powerful two (2) channel high end amplifier with low distortion and high performance, wireless streaming over AirPlay or DLNA, an AV receiver, and features such as HDMI connections for video devices. The simple and elegant contemporary Danish compact design features only three (3) buttons, a navigation control wheel, and a large display that is easy to read from across large rooms. The SoundBy PointSource Receiver design engineers specifically worked to develop a control system that is functionally simple yet feature rich, allowing you to get the best listening experience from your music. The SoundBy PointSource Receiver supports and is certified to use HDMI 1.4 including ARC (Audio Return Channel) and CEC (Consumer Electronic Control). With 3 HDMI inputs and 1 output to connect a TV, the SoundBy PointSource Receiver is easily able to work as the heart of a home theatre setup. Up to 3 HDMI devices, such as gaming consoles and DVD/Blu-ray machines, can be connected and will send the video to the TV via the SoundBy PointSource Receiver and the audio will be amplified to your loudspeakers. To maximise your listening experience, we recommend that you use the high quality SoundBy Point Loudspeakers to give a clear and powerful sound to your movies and games. By connecting a television with ARC, you can send the audio from the TV back to the SoundBy PointSource Receiver through a single HDMI cable. If the TV does not support ARC, the sound from the TV can be sent to the Receiver through either an analogue or digital cable. The CEC commands allows smooth and easy integration between the SoundBy PointSource Receiver and other CEC-compliant devices, thus allowing the volume to be controlled from the TVs remote control and the amplifier to be turned on/off with the television. AirPlay is a streaming solution provided by Apple that allows to you to stream audio from an iPad, iPhone, or Mac computer to the SoundBy PointSource Receiver. When streaming, the volume of the Receiver can be controlled directly by the Apple device. AirPlay works with many different music streaming services, thus making it possible to listen to millions of music tracks from Spotify and other streaming services. The SoundBy PointSource Receiver also supports DLNA. This technology allows for locally stored audio to be streamed from Android and Windows PCs to the Receiver. It is possible to stream music from different streaming services such as Tidal and Google Play Music to the Receiver via many third party apps such as Bubble UPnP (Android) and TuneBlade (Windows PC). The SoundBy PointSource Remote Control has been designed with the same philosophy: Simple and attractive design with only the necessary buttons needed for daily usage. The simple and easy-to-use resilient aluminium remote control has only 6 buttons: allowing for turn on/off, change input source, volume adjustment, radio station change, tone balance (EQ) adjustment, and sound mute/unmute. The Receiver can also be controlled by the official ‘Montana Sound’ App which, beside the functions on the remote control, can change all the settings. It permits the sound and loudspeaker settings to be easily be changed while still relaxing in the comfort of your favoured chair or sofa. The SoundBy PointSource Receiver is supplied with a FM/DAB+ receiver module, thus making it possible to listen to a variety of local and national radio stations by connecting the supplied FM/DAB antenna. The Remote Control allows you to select your favourite radio stations, or you can use the ‘Montana Sound’ app – where you can see additional information relating to the radio station. Two (2) analogue and two (2) digital inputs are available on the back of the SoundBy PointSource Receiver. This allows you to connect different audio sources such as CD players, DVD players, audio streamers (Sonos Connect), and to bring fresh life to your favourite records via a record player (a RIAA pre-amplifier must be used if you wish to connect a record player). 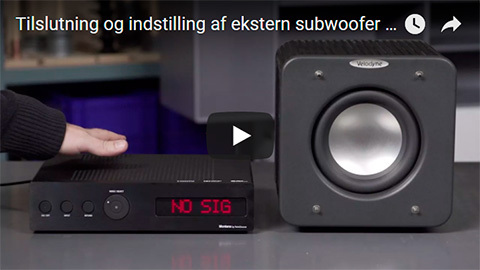 If you need more bass, you can connect a subwoofer to the ‘Sub Out’ output on the back of the SoundBy PointSource Receiver, and the crossover frequency between the front speakers and the subwoofer can be adjusted in the Receiver. 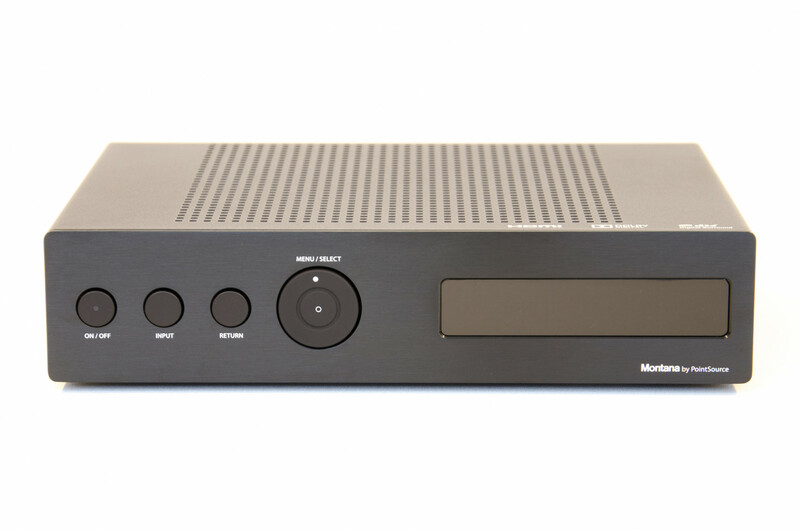 The SoundBy PointSource Receiver was specifically designed to be small and compact to allow a perfect fit into the Montana Furniture range of modules. 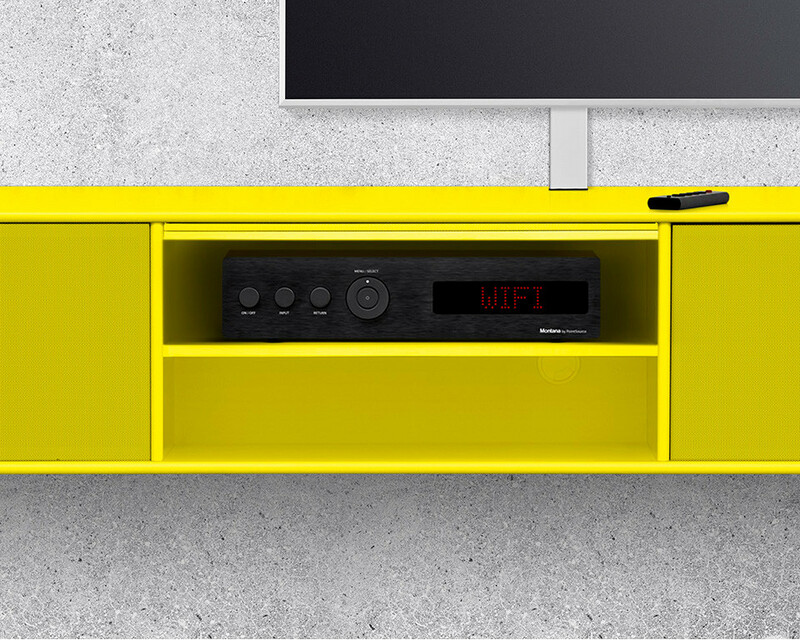 The compact size of the Receiver permits you to maximise the utility of space within your existing Montana Furniture modules with regard to positioning and size of the Amplifier. - The Montana Sound Unit has a build-in HDMI Hub. This means that video sources like Apple TV, BluRay, STB (Set Top Box) and Gaming Consoles can be connected with an HDMI cable directly to the Montana Sound Unit. This means that the HDMI cable from the Montana Sound Unit is the only HDMI connection on the TV. - To get the sound from the TV back to the Montana Sound Unit requires that your TV supports Audio Return Channel (ARC). Normally, only one HDMI input on the TV supports ARC, please consult the Manual of the TV for connecting an ARC audio receiver. - The HDMI cable Must be of the type High Speed and support HDMI version 1.4. - ARC has to be activated on the Montana Sound Unit. Under System Setup and HDMI, find ARC and set it to ON. After activating ARC, it is important to turn both TV and Montana Sound Unit Off and On again in order for the connection to start up the first time. 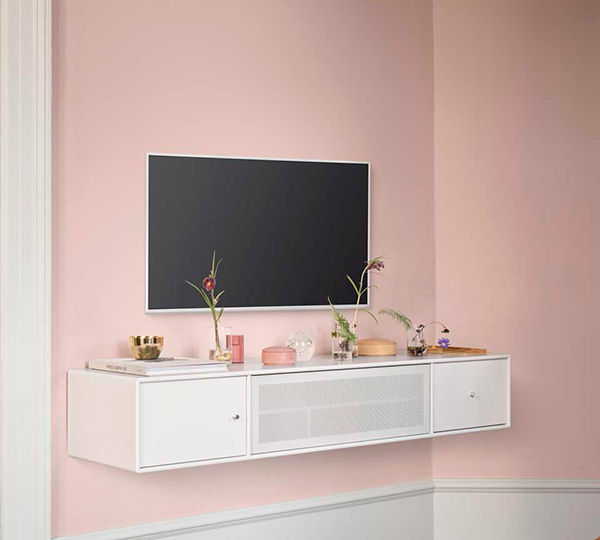 - In case that the TV do not support ARC, a separate sound cable needs to be connected between the TV and the Montana Sound Unit. This be an analog or digital cable depending on the outputs on TV, please consult the manual of the TV for connecting an audio receiver. Is there Internet Radio in the Montana Sound Unit? - No. There is not Internet Radio in the Montana Sound Unit, however there is both FM and DAB+ (Digital Radio). This ensures, that even without an internet connection, it is possible to listen to radio. The included FM/DAB antenna must be connected to listen to radio. Both my FM and DAB radio are unstable? - FM and DAB are broadcasted through the air, which needs to travel from the broadcast tower to the FM/DAB antenna. Every obstacle on the way such as walls, furniture and electronics will weaken the signal. It is therefore important that the FM/DAB antenna is placed correctly where it can reach the on-air signals. Try to move the antenna out of the furniture and to different positions to find a position where the signal is strong. In some areas, the signal is very weak, it can be necessary to connect an outdoor external FM/DAB antenna. Does AirPlay work from all mobile devices? - AirPlay is a technology made by Apple that allows music to be streamed to an AirPlay certified amplifier such as the Montana Sound Unit. AirPlay does only work on Apple devices such as iPhone, iPad and iMac. How to stream music from Android? - The Montana Sound Unit supports DLNA besides AirPlay. DLNA allows locally stored music on the phone to be streamed to the Montana Sound Unit. A good and well-known DLNA player is Bubble UPnP, https://play.google.com/store/apps/details?id=com.bubblesoft.android.bubbleupnp. The Bubble UPnP also supports streaming music from Tidal and Google Play Music to the Montana Sound Unit meaning that cloud-based music can be streamed. How can I stream from a Windows PC? - With iTunes, locally stored music can be played to the Montana Sound Unit over AirPlay. - With use of 3rd party programs, it is possible to stream any music/audio from the PC to the Montana Sound Unit. One of these programs is TuneBlade, which makes the PC in to an AirPlay transmitter. Thereby it is possible to stream Spotify, Tidal, YouTube etc. to the Montana Sound Unit. Can I stream locally stored music through the Montana Sound App? - Yes, locally stored music can be played from the Montana Sound App, or it can be played directly from the Music App on your iPhone/iPad, whichever you prefer. How much does the Montana Sound App cost? - The Montana Sound App is free to download and use. Is it a must to use the Montana Sound App? - No, the app is only optional to use. Music can be streamed directly from the Music App on the device and the settings can be changed on the Montana Sound Unit directly. I can’t find the Montana Sound App in App Store on my iPad? - The Montana Sound App is developed to iPhones and is therefore as default not shown when searching for Montana Sound on the iPad. It though works perfectly on iPad and in order to download it, the filter in the upper left corner in App Store should be changed from “iPad only” to “iPhone only”. Are there any streaming services build-in to the Montana Sound App? - There is no streaming services build-in to the Montana Sound App. Instead the original application should be used together with AirPlay. Can I use Spotify Connect with the Montana Sound Unit? - Spotify Connect is not currently being supported by the Montana Sound Unit. Can I play music from my NAS Server to the Montana Sound Unit? - Yes, if your NAS supports DLNA. Some NAS have built-in DLNA which can stream directly to the Montana Sound Unit by a control app. Others, can be streamed through your Mobil phone through DLNA apps such as Bubble UPnP. - Please consult the manual of your NAS for DLNA options. Which WiFi frequency does is support? - Montana Sound Unit uses the WLAN standard 802.11g which works on the 2.4 GHz frequency band. Is it possible to stream music to multiple Montana Sound Units in my home? - AirPlay on iOS devices (iPad, iPhone, iPod Touch) are limited to 1-1 connection, and does therefore not allow to stream to more than one at the time. - It is though possible through a PC or MAC computer through iTunes. AirPlay in iTunes allows for streaming to multiple AirPlay devices such as the Montana Sound Unit. - Through 3rd party programs, such as TuneBlade, it is also possible to stream Tidal form your PC to multiple Montana Sound Units. 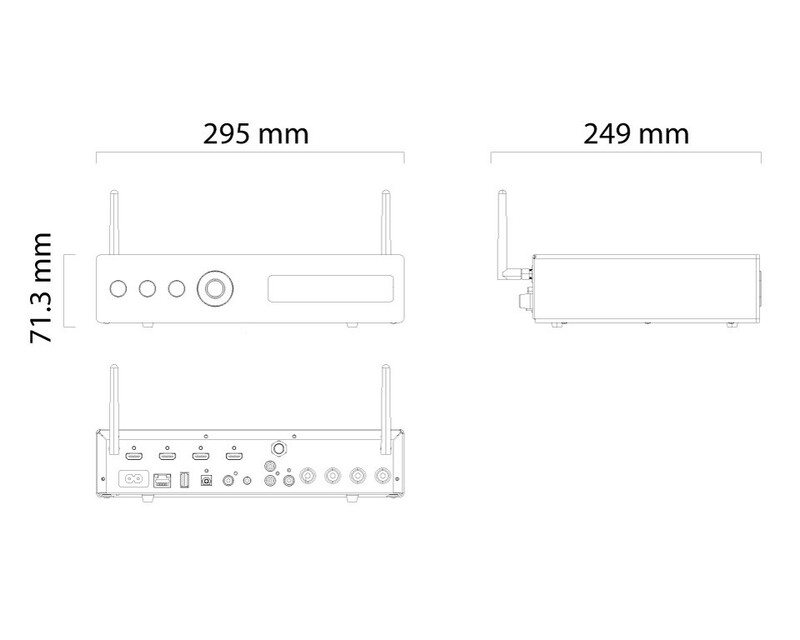 How many AirPlay devices can I stream to at the same time? - This depend highly on your home network connection and stability but between 3-6 devices should be possible on most networks. I have connected my Montana Sound Unit to my home network by I can’t see it under AirPlay devices or I experience dropouts in the sound when I stream? - It is important that the Montana Sound Unit and the iPad/iPhone is connected to the same network. - If the wireless connection between the router and the Montana Sound Unit is on the edge of a good connection, then It can happen that it will not show up under AirPlay. Try to move the router and Montana Sound Unit closer or each other or connect a LAN cable between them. - Some routers does not allow AirPlay or that devices can talk together as default. It may be a good idea to search the internet of consult the router manual for any known issue with AirPlay. Can I stream video/movies via AirPlay to the Montana Sound Unit? - Apple only license music/audio streaming through AirPlay which means that the Montanan Sound Unit only supports transfer of audio/music. - Video streaming over AirPlay is limited to Apple TVs which can be connected to the Montana Sound Unit with an HDMI cable. Is there a LAN connection in the Montana Sound Unit? - The Montana Sound Unit has a LAN input for internet cable connection. This ensures a steady and solid connection between the Montana Sound Unit and the router. Can I connect a subwoofer if I want a deeper bass? - Yes, beside the loudspeaker terminals, there is a RCA analog output for connecting an active subwoofer. Under Speaker Settings, it is possible to set the cross over frequency between the subwoofer and the loudspeakers connected to the Montana Sound Unit. How many speakers can I connect to the Montana Sound Unit? - The Montana Sound Unit is equipped with a high quality 2 channel stereo amplifier which means that two speakers can be connected to it. An active subwoofer can also be added through the SubOut output. Can I connect active loudspeakers to my Montana Sound Unit? - No, the Montana Sound Unit has an integrated amplifier which therefore should be connected to traditional passive loudspeakers such as the Montana Sound Loudspeakers. Can I connect wireless loudspeakers? - There is no option for connecting wireless speakers. Can I connect a record player to my Montana Sound Unit? - The output from a record player needs to be amplified through a so-called RIAA-amplifier, a preamplifier for record players. Some record players have a build-in RIAA-amplifier and some needs an external one. The output of the RIAA-amplifier can be connected directly to AUX2 input on the Montana Sound unit. What can I connect to the AUX inputs? - The AUX1 and AUX2 are both analog inputs but they differ in the input level. AUX1 is designed for low-output sources such as phones and PCs whereas AUX2 is designed for standard analog output levels such as CD-players, RIAA-amplifiers, Streamers etc. Can I connect headphones to the Montana Sound Unit? - No, the Montana Sound Unit does neither have a headphone amplifier or a BlueTooth connection. When the Montana Sound Unit is placed in a small Montana compartment, does it need extra ventilation? - The Montana Sound Unit is designed and optimized to be able to be placed in the small Montana compartment of *2 x*6. It is though important that the front of the furniture is open or perforated to help with air circulation. Does the Montana Sound Unit contain a hard disc for music storage and playback? - Due to the small and very compact design of the Montana Sound Unit, there is no space for a hard disc in it. Is the Montana Sound Remote Control a universal remote which can control other devices? - No, the remote control is designed to be simple and user friendly and has therefore only very few buttons necessary to operate the Montana Sound Unit. Can I control the Montana Sound Unit with a universal remote control? - Through the app, the firmware of the Montana Sound Unit can be checked and if a newer firmware version is available, the app will guide through the update process. Both our YouTube channel and local pdf database contains valuable information on how to solve issues with setting up your new MSU.